Science Goals: What’s in an Environment? The title of this section on the ALFALFA website is more officially: Galaxy Evolution and Dynamics within Local Large Scale Structure. However, that seemed like a mouthful for what is a rather straightforward idea. We know that there is large scale structure within the universe; there are clusters and filaments of galaxies and voids that lack galaxies. 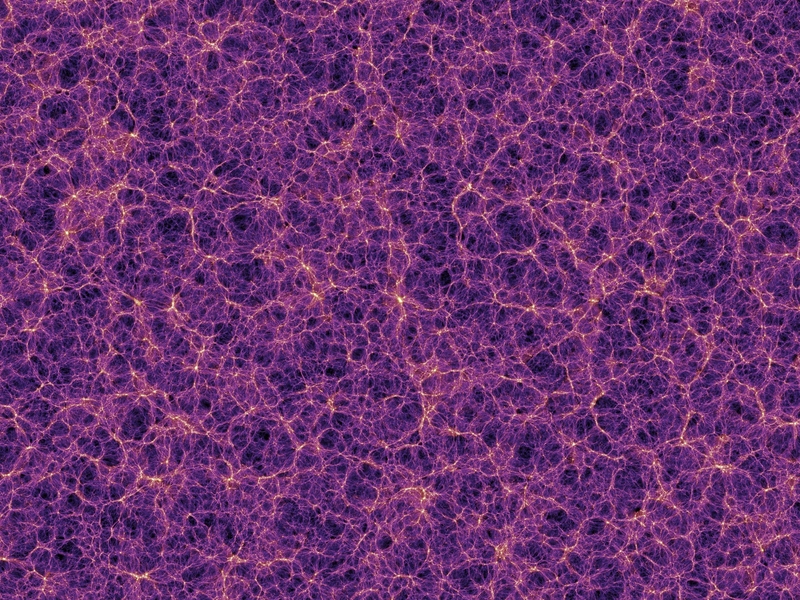 The picture below is from the Millenium Simulation and shows this structure; the brighter colors represent regions that have a higher density of matter (more galaxies). One of the interesting questions in extragalactic astronomy is understanding how these different types of environments affect the galaxies that reside there. What are the differences between a galaxy in a cluster and one in a void? For example, we know that galaxies in the interiors of clusters tend to have less neutral hydrogen than similar galaxies in a less dense region of space. This is because clusters have hot gas that strips the neutral hydrogen out of galaxies as they fall into the cluster center. The survey area of ALFALFA was designed to help address these questions about the role of environment. The “spring sky” of ALFALFA includes the Virgo Cluster, a nearby galaxy cluster. Since the Virgo Cluster is relatively close, distances can be estimated for galaxies using what are termed “secondary methods”. These methods make use of some quantity that we can measure (such as rotational velocity or period) which is related in a known manner to the absolute brightness of an object. Having distance estimates for these galaxies and recessional velocities allows us to place the galaxies relative to the cluster center in position space and velocity. Then, we can study what happens to galaxies as they approach the cluster center and try to figure out exactly what changes occur, especially in terms of their gas content. If you want to study a cluster environment, you need a reference to compare against. For this reason, the “fall sky” of ALFALFA includes part of a nearby void. This gives us the opportunity to study galaxies that are isolated and have presumably developed unaffected by neighbors and interactions. By comparing galaxies from high and low density environments, we can start to understand how the environment affects these different galaxies. How are the galaxies similar? How are they different? In answering those questions, we learn in what ways environment matters. In addition, ALFALFA includes several galaxy groups in the survey area. Galaxy groups are a medium density environment; there aren’t nearly as many galaxies as in a cluster but there are enough galaxies that interactions do occur. Studying galaxy groups allows us to determine when environment becomes important. Does we see effects as soon as the environment is slightly dense? Or is there some critical level at which environment becomes important? When I was taking one of my first astronomy courses as an undergraduate, the TA told our class that if something didn’t make sense in astronomy if it was because it was “either quantum mechanical or historical”. This statement was quite true for me for several years, especially the second half. Astronomy has a lot of interesting terminology that has been collected over the years. Being immersed in the field, I sometimes forget how much seeminly random jargon is thrown around. So I decided I would start a series of posts describing some of this terminology. That way, when I use it without thinking, I’ve already explained what I mean. Since ALFALFA is a radio survey, I thought I would start by describing the jansky. The jansky is a unit of flux density named for Karl Jansky, who was the first person to detect radio waves of an astronomical origin. (He detected radiation from the center of our Galaxy.) Flux is a measure of energy per area, and the typical SI units used for measuring it are watts per square meter. Flux density is a measure of flux per unit frequency; if a source emits over a range of frequencies, the flux density describes the flux at specific part of the spectrum, rather than the total flux summed over the spectrum. One jansky (abbreviated Jy) is . The jansky was originally designated for use in radio astronomy because it was the right order of magnitude for early radio sources. It is much easier to report a source with a flux density of 17 Jy as opposed to . A jansky also gives a good intuitive sense of how strong a source is. If I see an object with a flux density greater than 1 Jy, I consider it a “bright” or strong source. We routinely find galaxies that are a hundred times fainter, on the order of 10 mJy (milli jansky). Developing an intuition for source strength is important as it provides a reference frame: Is this a good (believable) detection? Is the source interestingly bright (or faint)? 9:30 pm: I arrive at the office. I’m not scheduled to be the telescope for an hour yet. This is my time to collect everything I need for the night (notes, pens, etc.) and take care of important tasks – making myself a pot of coffee. 10:00 pm: Time to start preparing for the observing. This is when I call the telescope operator, mostly to let them know that I’m here and ready to log in for my observing time. I’m also setting up all the remote connections I need for the run now. We use VNC for our remote observing. This is a program that allows me to remotely display the desktop of one of the computers at Arecibo. In essence, I’m running the programs that control the telescope and observations on a computer at Arecibo and using a viewer to have these programs displayed in front of me in Ithaca. The nice thing about this is that if the internet connection drops out for a minute for any reason, the programs are still running at Arecibo – our observations aren’t affected. 10:30 pm: I’m on the telescope now! Which means it’s time to start slewing the telescope to where we need it for the night. This requires moving a giant arm that suspends the housing holding the receivers above the dish. As the support arm and housing case for the receivers are both quite massive this can take a while. 10:40 pm: The telescope is in position and it’s time to start observations. First, I run a script called TOGS which does calibrations for another observation program (G-ALFA) that piggybacks off of our observations. This means that they record data while we are observing and use it for their own studies. 10:48 pm: TOGS is done running and it’s time to start the observations for the night. I tell the telescope to start observing. Ann talked earlier about how we observe, letting the telescope stay still and the sky move through the receiver. This means that I don’t need to tell the telescope to do anything more until our time is up for the night and I start the observations. My main job now is to monitor the data coming in and keep our log of the observations up to date. Does everything look good? Do I note something odd? Then I should make a comment in the observing log. Does something go wrong on the backend of the telescope? Then it’s a bad night and I need to halt the observations, reset and start observing again. 12:30 am: I thought I would share a little bit of the data monitoring with you. The image below is a screen capture of the programs I use to keep an eye on things. The top window monitors the power in each beam. ALFA has seven beams, each with two polarizations. You can see that the one there is one red number. The power in one polarization of beam 6 is extremely low. This is because this beam polarization is dead; it’s not receiving any signal. This is a known problem and something I can ignore. I need to make sure the power levels in the other beams stay within accepted values (blue). If the powers get too high or low, the values change color to help alert me. If the power levels start to go all crazy, I might need to restart things. The bottom window contains the waterfall plots. This shows the data instantaneously coming in for each beam, cascading up the screen. If some sort of interference or strong source comes into the beams, I can notice it in these plots and make a comment in the log file for the night. You might notice that there is a strong white line to the left side in each of the waterfall plots. This is the FAA radar for the San Juan airport. There is also a white line to the right side of the plots. It’s harder to notice than the other line, but try looking at the center and upper leftmost plots. This is the hydrogen in our own Galaxy. 2:16 am: It’s the most excitement observing has offered me tonight: I notice some GPS bursts. (Not that I mind quiet nights observing at all.) See the little white dots in the centers of the plots below? That’s a short burst of radio signal from the GPS (Global Positioning System) satellites in orbit. This is a type of noise called RFI – radio frequency interference. Humans use radio frequency for communication and this produces signals that are observed incidentally with radio telescopes (like the airport radar). As you might guess from the name (interference and all), RFI creates issues for radio astronomers. Typically, we mark where RFI occurs so that we can mask those parts of our data. We’re not going to be able to see any astronomical signals within the RFI and we want to get rid of it. I made a note in the log of the GPS burst so that whoever processes the data from tonight’s observations will know that there was this extra RFI that they need to mask. These GPS bursts have been extremely short in duration which is nice. It means that there is less data we will need to mask out. 2:23 am: I get a little bit more excitement. This time what shows up is a continuum source. Do you see the bright swath across the bottom two plots? It is a little bit higher and fainter in the left plot. The sources the survey is designed to detect are “line” sources; they are the result of emission at a specific frequency (with Doppler shifts) due to atomic transitions. There are other types of sources in the sky which emit at a broad range of radio frequencies; they are referred to as continuum sources since they emit across a continuum of the spectrum. These sources are typically powered by a process known as synchotron emission. You can see below how these sources show power across the plot, which shows the whole frequency range we observe. While we are not observing continuum sources for science (although they can be quite interesting), we do use them to help with pointing corrections. The positions of continuum sources are typically known to high accuracy so we can use them to know exactly where the telescope is looking. Some continuum sources are strong enough that they can create artifacts in the data that make processing a little bit more challenging. Once again, it is something that is useful to note in the log when they occur. Plus, it helps me feel like I’m doing something active for the observing. 3:30 am: This is what I get for blogging about a night’s observing: an error message I’ve never seen before. ERROR ‘Taking drift scan …’ should have finished 4 minutes ago! Not the most comforting words and it also flashed red at me in the display which tends to induce panic. I’m still not quite sure what seemed to happen. We observe the sky for ten minutes at a time before firing a calibrator and starting another ten minute observation. We call each of these ten minute chunks a ‘drift’. When this error message came up, I noticed that countdown on the current drift was off compared to when that drift had started. That is, less time on the countdown for the drift had elapsed then since the drift should have started. I thought I had a few minutes until the next drift started, so I was searching through the log generated by the observing software to see if I could figure out what happened. While I was doing this, the next drift started at the time I would have expected it to had I not seen an error message. Things seem to be running smoothly now, so I’m not going to worry about it too much. I did run a program called ‘quicklook’ which produces a quick spectrum of the data. It produced the image below, which looks exactly like I would expect. I can see the dead beam, the radar (left spike) and the Galaxy (small right spike) – all things I know about. Really, I was checking to see if the file with that drift was “good”. I’m mostly glad that the program didn’t crash when I ran it as it would have if there had been something grievously wrong with the data file. There’s still a possibility that the file could be bad. If it doesn’t contain a full ten minutes worth of data, it will cause issues with our data processing programs. At the end of the night, I run a script that converts all the data from FITS files (a type of image used in astronomical applications) to a structure that can be read by IDL, the software program we use for our data processing/analysis. I will probably find out then if there are any issues with this drift. 05:12 am: The internet connection dies. No online music for me and the VNC viewers stop updating. 05:16 am: I’ve been debating at what point I call the operator to see have them end the observations at Arecibo (it’s near the end of the night) when I regain an internet connections. My VNC viewers update. A wonderful feeling. 05:30 am: The end of the scheduled night’s observing. I stop the current drift and run the end of the night TOGS script. The time for running TOGS is scheduled on as additional time at the end of the night – it isn’t part of the block assigned to our program. Now I do all the fun end of the night things. I make a list of the files we observed, moved the logs from the night to the directories they belong in, update a webpage with the night’s observing information, convert the FITS image files into another type of data structure. Basically, it’s end of the night housekeeping. Normally I would have left the office by now, but I’m sticking around to make sure all the IDL structures are properly created from the FITS files as I’m worried about the one drift from the middle of the night. That’s what I get for blogging about observing. Oh well, it could have been worse. I could have had a failure that required me to stop observations and restart. I can safely say this now because I’m not just done observing for the night but for the near future. 05:56 am: Woohoo! The file I was worried about was created just fine. Now I can go home and sleep. I was all set to write another post that was related to some aspect of observing. Except that, as sometimes happens when observing, my body failed to make the adjustment from a day to night schedule. One of my least favorite aspects of observing is switching to the night schedule. I enjoy daylight and find it difficult to stay asleep once it’s light outside. One of the nice aspects of traveling to the telescope to observe is that the accommodations are designed for daytime sleepers with lovely shades that are extremely effective at blocking sunlight. As much as I love sleeping in my own bed, I should make the investment in some better curtains. Hopefully I’m tired enough now to be able to sleep past noon and will be able to write something coherent tomorrow. I’m observing remotely from Ithaca for the next few nights and thought I would take the opportunity to write about topics that I find relevant to observing. One of the questions I ask myself a lot while observing is: What time is it? Often this is a question of frustration, especially around four in the morning (which is when I have the most trouble focusing and staying awake). Other times, though, it is a relevant question for the observing. Mostly this is because there are a lot of different times that you need to keep track of while observing. First, there’s the time zone you live in. For remote observing this time zone remains important because you are still operating in it. When traveling to the telescope this is a less important time, although it does affect your body’s .adjustment to the night observing schedule. The second time of importance is the time zone where the telescope is located. When I look at an observing schedule for Arecibo, I need to remember that the times listed are in AST (which I like to think of as Arecibo Standard Time even though I know it’s Atlantic Standard Time) and not my local time zone (EST or EDT depending on the time of the year). The difference between the telescope time and my local time can lead to me being extremely paranoid and double- and triple-checking start times. If I’m observing at an optical telescope, I typically know sunrise and sunset in local time and schedule accordingly. It can also be quite confusing to switch between working on my laptop which is on my local time and the computers used for observing that show the telescope time. There’s a third time zone to worry about, too: Universal Time (UTC). Often, astronomers choose to record time stamps for data in UTC to avoid the confusion of time zones and daylight savings time. I don’t use this time for the ALFALFA observations but have used it when observing at optical telescopes. Typically, I don’t have to worry about thinking in this time zone, though; I only need to occasionally write the time down from the computer screen. Three time zones manages to confuse me a bit as it is but are fairly manageable. After all, it’s just adding/subtracting a certain number of hours. Annoyingly, the number of hours changes with daylight savings time, making life that much more interesting in spring and fall as you try to remember the change. (I tend to be a little paranoid when it comes to observing.) However, there is another type of time important in astronomy that is not as simple. That time is LST: Local Sidereal Time. Essentially, this new type of time is related to the coordinate system used for stars and astronomical objects (hence the sidereal), rather than being based on a solar noon. I found the concept of LST confusing at first, but it makes observing much easier once you understand it, so I’m going to attempt to explain it. The first step to understanding LST is knowing a little about the coordinate system used to describe the sky. Typically, the sky is pictured as a “celestial sphere” where all the objects visible in the sky are projected onto a sphere. This sphere is defined by two coordinates: right ascension (RA) and declination (DEC). Right ascension is the analog of longitude on the Earth and is marked in hours from 0h to 24h. Declination is the equivalent of latitude and runs from -90 degrees to +90 degrees. A schematic of the celestial sphere is shown below. As the Earth rotates within the fixed celestial sphere, the ranges of right ascensions visible will change as objects rise and set over the horizons. LST is a way of conveying what astronomical objects are visible at a given time. The current LST refers to the RA that is currently at zenith (highest point in the sky). Thus, if the LST is 08h 44m 14s currently, an object at that RA would be at its highest point in the sky for the night. Since the coordinates of astronomical objects are normally given in RA and DEC, knowing the LST helps one know immediately if an object is observable. For the LST I just mentioned, observing an object with a RA of 08:05:36 would make perfect sense, but if the RA were 04:21:43, the object would be near setting (almost four hours from its highest point) and I probably wouldn’t want to observe it. If the RA were 20:21:04, the object would be on the other side of the Earth (about twelve hours away from zenith) and unobservable. So, the sidereal in LST comes from the fact that the time is determined by the coordinate system defined for stars (and other astronomical objects). The local is also quite important. The LST at Arecibo is quite different than that at Mauna Kea, Hawaii. An object that is overhead in Puerto Rico would not have yet risen for Hawaii. That’s one of the beauties of LST; it tells you exactly what is observable for your location. Once you get the trick of it, LST is the most useful time for observing as it gives you an immediate sense of where an object in the sky is located. Is it near zenith? If the RA is near the LST it is. Is it still rising? LST increases throughout the night, so if the RA is greater than the current LST, the object is still rising and can be observed later. Has the object already passed by? If the RA is much smaller (typically by about four hours) than the LST you have probably missed your chance to observe the object that night and should schedule it for tomorrow. Of course, LST lacks intuition in the sense that I can’t say, “Oh, it’s about 7:30 LST”. I let the computer tell me what the LST is currently. A large part of the reason that LST is not intuitive is because it doesn’t track the solar time we are used to. If the LST at midnight tonight is 07h 30m 00s, in six months the LST at the same solar time would be 19h 30m 00s. If you think about the difference in constellations from the summer to winter months, this difference makes sense. We know that we see different constellations overhead at night at different times of the year. This is the result of about a four minute difference between a day as defined by the sidereal and solar systems. While this difference is understandable, it does mean that if you ask me at any given time what the LST is, I’m unlikely to know unless I happen to be observing. The real time I care about? It’s about five hours until observing is done. I’m feeling pretty awake right now, but in about two-three hours I probably won’t be feeling as alert. You’ll hear a lot about neutral hydrogen on this blog, but ALFAFA also has science goals that don’t involve the 21 cm line. One such project is the detection of OH megamasers. Lasers (Light Amplification of Stimulated Emission of Radiation) are familiar to most people. Masers are the same thing except that they emit in microwaves rather than optical wavelengths. In an OH maser, the line transition between two different electron levels in the molecule is strongly amplified. The megamasers get their name from the fact that they are a million (the mega prefix in scientific units) times stronger than the regular OH masers that were first observed in astronomical situations. The lines that are commonly excited in OH megamasers occur at 1665 and 1667 MHz. These are at a higher frequency than the ALFALFA observations which occur in the range of 1335-1435 MHz. However, we can observe these lines when their are frequencies are red-shifted enough due to the recessional velocities of the galaxies they occur in. Due to the expansion of the universe, galaxies that are more distant from us appear to have higher recessional velocities; empirically, this phenomenon is known as Hubble’s Law. The redshift, z, of a galaxy is often used to describe how much the wavelength/frequency of light for an object is shifted. For the OH megamasers, the lines of interest move into ALFALFA’s frequency window for redshifts between 0.16 and 0.25. This corresponds to galaxies that are between 631 and 941 Mpc (2 to 3 billion light years) away. OH megamasers are associated with merging of large galaxies. By finding and studying the distribution of these sources, we can learn about the merger rate during the history of the universe. As we observe objects that are further away, we are also seeing younger objects as the light has taken longer to reach us. Thus, we can try to understand how the merger rate varies with redshift, or age of the universe. where is the wavelength and is the frequency of the light. The subscripts refer to whether it is the value of the wavelength/frequency emitted by the source or the value measured by an observer at some relative velocity. where the currently accepted value of the Hubble constant ( ) is 70 km/s/Mpc.